Heat the olive oil in a large pan where you can fit the 4 fillets. Season the fillets with salt and pepper to taste. Carefully add them to the hot oil and fry for 2-3 minutes on each side. In the mean time, combine the tomatillos, onions, jalapeños, cilantro, garlic, oregano, water and salt to taste (I used 1/4 teaspoon of salt) in a blender until you have a well-mixed sauce. Add the sauce to the fish, cover and let cook for 10 minutes; the sauce will change from a vibrant green to a darker green. You can use fresh oregano instead of ground oregano; you'll just need half the amount. If you buy frozen fish, remember to defrost for 1-2 days in the refrigerator before cooking. At home we like to have at least one meatless day a week, and for those days vegetables, cereals or fish are great options, especially fish. One of our favorite sauces is salsa verde and my refrigerator always has at least one jar of it. I prepare it each week and we add it to quesadillas, eggs, meats and more. 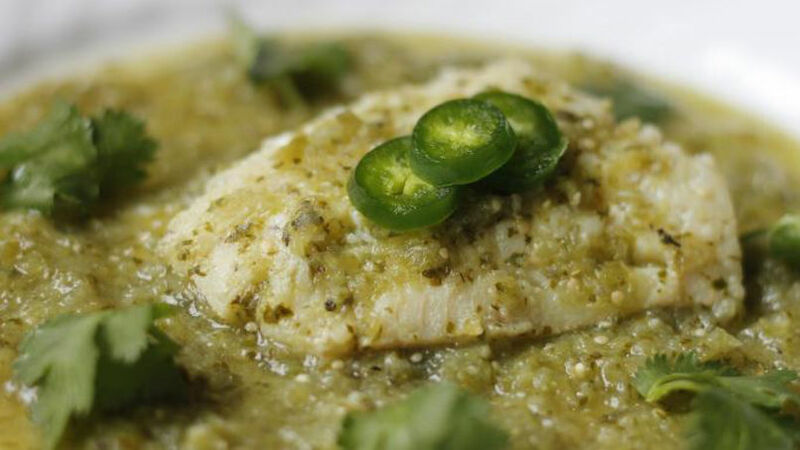 We discovered that the combination of salsa verde and white fish is also very delicious, and I like to add garlic and a bit of ground oregano to the sauce recipe. This is a light, easy and quick dish to prepare; you only need about 20 minutes. I recommend serving it with white rice, vegetables and a bread roll to absorb every last bit of the sauce.